A new release from The Infant Cycle finds its way into my arms, and what a pleasure it Is to receive it! In this album you can find nine tracks, all obscure in their curious construction and satisfying in their execution. The building blocks for these nine gates of the Drop-out center are varying to the extreme. You can find electric mandolins, Poly-808, bird cages, field recordings and many more common instruments in the list that specifies what was used on each of the tracks. Why is this important? 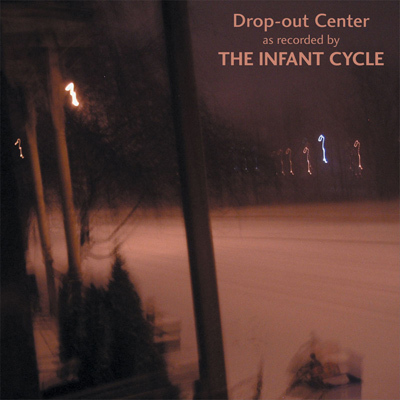 Because the complete creation of Drop-out center sends a unified and holistic feeling with each of the tracks, and sometimes I even fail to understand where the specified instruments are. I believe this is a great advantage in this case, and the result reminds me of a wonderful self titled album by Azure Skies. The two albums probably share very different set of instruments that created them, but they both are fantastic in how they are solid enough and complete enough to allow themselves to be detached and alienated almost until they are unbearable, and only then the artists decide to touch the listeners and create a catharsis. I like ‘Pool Skin’, in which thin epidermises of soft music similar to the wonderful music you can get from ‘A silver Mt. Zion’ and their friends are drowning in soft pulses of broken sound. It should be distressing to the ear and to the mind, but it is strangely comforting, I know not why. The uncomfortable factor is even magnified on ‘Fall asleep in the car’, where there seem to be a squeaking door echoing all over the ghostly track, as if to anchor the ethereal mandolin to the blurry ground. Wherever it is that we hit the ground as listeners to this album, I am completely satisfied and content. Check this album out.